We have a reputation for achieving excellent results based on research, our Consultants market knowledge together with first rate negotiations. This is why we obtain repeat instructions and recommendations for new business. Our offices are located on Newman Street, on the north side of Oxford Street between Oxford Circus and Tottenham Court Road tube stations. Mike is a Fellow of the Royal Institution of Chartered Surveyors (RICS) and a Fellow of the Chartered Institute of Arbitrators (CIArb). He qualified as a Chartered Surveyor in 1984 and has over 30 years experience gained mainly in private practice. Mike's experience includes negotiating rent reviews and lease renewals for both landlords and tenants, acting as an expert witness together with asset management. A particular speciality has been negotiating rent reviews on large space users such as supermarkets. Further to this, Mike is also a member of the Dispute Resolution Panel at the RICS and regularly acts in retail rent review disputes. A significant amount of experience has been gained in dealing with shopping centres, not only concerning dispute resolution but also with regard to development and refurbishment advice. In addition, Mike recently successfully completed a MSc in Real Estate at The College of Estate Management, his final year dissertation was entitled "Sustainable Asset Management and the issues concerning retailers in UK Shopping Centres". Ian is a Chartered Surveyor with almost 40 years' experience in the property sector, specialising in finance and investment, development and fund management. His career has included 22 years with Norwich Union (now Aviva), where he was Property Investment Director responsible for their £2.5bn retail and leisure fund. He left Norwich Union to join Chartwell Land plc (Kingfisher plc's property arm) as Development and Investment Director. He holds a Masters degree in Land Economy from Cambridge University, and is a past President of the Cambridge University Land Society. While his career focussed mainly on the retail sector (and he served for 6 years as a Director of the British Council of Shopping Centres) his interests range across all property sectors and current roles include serving as an Independent Director on the Board of Havebury Housing Partnership (a housing association managing some 6000 homes). Jerry has over 20 years experience in real estate development, investment, management, acquisition and disposal in the Baltic States. He has invested for his own account into residential, commercial, logistics and hospitality assets, has developed and successfully disposed of food anchored retail portfolios and brown field hotel developments. He holds positions in prime cash flow office properties, residential and logistics developments. Through his property management company he has also acted for investors in residential, commercial and land acquisitions, management and disposal. With over 25 successful transactions with his own companies, he specialises in portfolio acquisitions, structuring sale and leasebacks, and distressed / opportunistic acquisitions. One of his SPV's has a publicly listed subordinated bond issue on NASDAQ OMX Riga exchange. He graduated with honours in Finance from Illinois State University in the U.S. Before arriving in the Baltics in 1992, he worked for Caterpillar, Inc. in their Treasury department in the U.S. He is the former Chairman of the American Chamber of Commerce in Latvia, the Foreign Investors' Council in Latvia and continues to chair Ronald McDonald House Charities Latvia, which he founded in 2007. He resides in Latvia with his wife and children, and speaks Latvian, Estonian, bad Russian and worse French. Will is a Member of the Royal Institution of Chartered Surveyors and sole Principal of Rumsey and Partners, with over 25 years experience gained in all sectors of real estate acting on behalf of landlords, investors and occupiers. Will's primary area of activity in recent years has been in identifying investment opportunities for cash rich investors seeking to take advantage of the lack of debt funding/re-financing. This has resulted in him buying from funds, banks and receivers for property companies and being able to advise clients on the detail of the deal and working closely with their professional advisors. In addition, he has also been active in the industrial and trade sectors advising on lease re-gearings, lettings and sales in what has been a tough market. Will's key to success over the last six years has been his extensive market knowledge, wide network of contacts, working with experienced colleagues and consultants; and on his ability to spot an opportunity and close the deal in an entrepreneurial and professional manner. 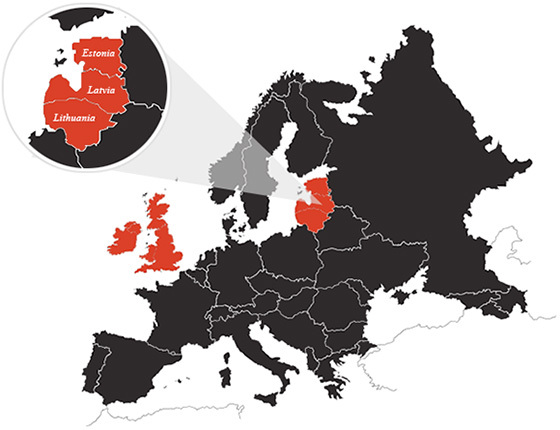 Offering real estate advice to potential investors to the Baltic States. Subsequent to independence from the former Soviet Union in 1991; Estonia, Latvia and Lithuania have embraced democracy, the rule of law, private ownership and market price resource allocation. All three countries are members of the European Union and NATO. The Baltic States are internationally competitive with a well educated labour force. Unlike some other EU countries the Baltic States have survived the current recession and returned to growth. In the 'new Europe', the Baltic States have re-established themselves as members of the Northern European group of countries that have sound fiscal policies, low public debt and dynamic economic growth fuelled by exports. All three countries are members of the euro. The main drivers behind their economic success are foreign Direct Investment, with an emerging middle class of consumers that has disposable income together with an expanding infrastructure of retail outlets.